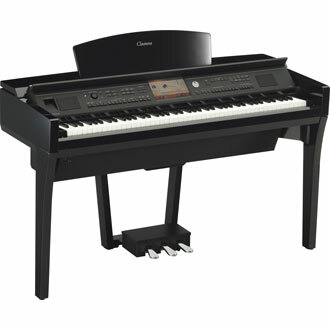 The finest piano sound and the finest piano touch in the most advanced Clavinova ever. From professional piano performance to simply discovering the joy of music for the first time, the CVP-709 is truly a family musical entertainment center. It's the first CVP Clavinova featuring not one, but TWO world-class grand pianos (Yamaha CFX and B?sendorfer Imperial) inside one digital piano. The Piano Room feature has been expanded to include more pianos and a new Session Mode with a built-in recording studio for capturing and sharing your music. In addition to the NWX (Natural Wood X) keyboard with synthetic ivory keytops, the 88-key Linear Graded Hammer action dedicates a unique weight for each key over the entire keyboard. Each key also features carefully-adjusted counterweights for improved playability when playing pianissimo and better key return in rapid passages. The NWX keyboard also features an escapement mechanism that reproduces the feel of an acoustic piano as it goes through the let-off and drop of the hammer when a key is played very softly. Beyond the CVP-709's piano performance is a wealth of interactive musical features capable of making music fun for anyone regardless of skill level or experience.